"Maureen O’Reilly and her younger sister flee Ireland in hope of claiming the life promised to their father over twenty years before. After surviving the rigors of Ellis Island, Maureen learns that their benefactor, Colonel Wakefield, has died. His family, refusing to own his Civil War debt, casts her out. Alone, impoverished, and in danger of deportation, Maureen connives to obtain employment in a prominent department store. But she soon discovers that the elegant facade hides a secret that threatens every vulnerable woman in the city. Despite her family’s disapproval, Olivia Wakefield determines to honor her father’s debt but can’t find Maureen. Unexpected help comes from a local businessman, whom Olivia begins to see as more than an ally, even as she fears the secrets he’s hiding. As women begin disappearing from the store, Olivia rallies influential ladies in her circle to help Maureen take a stand against injustice and fight for the lives of their growing band of sisters. But can either woman open her heart to divine leading or the love it might bring?" Wow. It's been quite some time since I picked up a book and had a hard time putting it down. However, this book broke that streak. I started reading this book before bed one night and it was about 4am when I looked up and noticed what time it was. Man, I was tired the next day but the next night, I was back at it! I loved the characters in this book. Maureen was so amazingly relatable. From the first time I met her in the book until the final pages, she was someone that I wanted to know. Olivia was just the same way. As I watched their journeys throughout the book, I felt as if I were making friends. When I turned the last page, I sighed. Closing the cover was like losing a friend. I cannot encourage all of you enough to go out and find yourself a copy of this book. Start with the author's website and don't stop until you have this book in your hands. I promise that you won't regret it. I received a copy of this book via the Tyndale Blog Network. All thoughts, opinions and comments are 100% mine. how long has this book been out for? I want to get back into the swing of going to the Library so hopefully I will be able to pick this up there as it sounds awesome!! 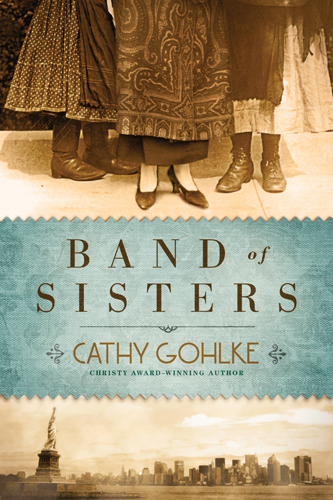 Thank you, Katie, for your excellent review of "Band of Sisters." I'm so glad you enjoyed the book and that the characters resonated with you. They seemed like friends to me, too!